Earlier topic: Anyone know the name of this Italic typeface? 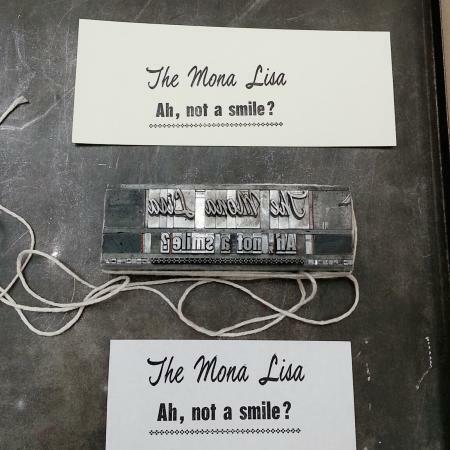 Anyone know what typeface “Ah, not a smile?” part is? Please help me out!! Looks like Placard Bold Condensed to me! Yo, this was a hot metal face, not a digital face. San serif faces are not my forte, but I’d guess that is Franklin Gothic Extra Condensed (issued by ATF in 1906). Definitely not Franklin Gothic - .the lowercase t in Franklin has tail, this does not. I’ll still go for Placard Bold Condensed! It’s not Placard Bold Condensed unless there is an alternate ‘a’, nor is it Franklin Gothic Extra Condensed. I am going to assume that you are not showing American types as there are no ATF or American Monotype faces that match. If you can identify it as a foundry face perhaps there is a pin-mark that could help, if it is a Monotype casting, then that would narrow it down quite a bit. A hint as to where you are located would help a lot, so as to narrow down what types were likely sold in your area. It looks to be a later design, possibly 1950s or 60s, because of the lack of tail on the lowercase ‘t’, and the uniform geometric shapes of the letters. I remember working with a Monotype face that was similar, and called Airport Gothic (which might have been another name for Tourist Gothic which is not what you are looking for), but I don’t have a showing of that particular face. It is very similar to a CG face called Block Gothic, but I have no idea if that is a name that was used for metal foundry types. I don’t find a reference to Placard being the name of any typeface in ATF or Lanston Monotype specimens that I have. In looking through my large Lanston Monotype catalog, the closest thing I can find is Poster (Hess), No. 700. It’s listed in Jaspert, Berry & Johnson’s Encyclopedia of Type Faces as Monotype face (probably English), and was introduced in 1958.